What is the difference between home theater sound and two channel sound? In modern motion picture productions audio is recorded with the same stringent requirements as that of audio only recordings. The differences in quality for modern multi-channel recordings is little when you realize that music only dts® and DD 5.1® CD's and DVD's are breaking tremendous ground for bringing realism to the playback performance. No compromising on bass quality here and when you watch a movie the soundtrack is constantly changing from natural sounds to music and then all together. How can we define the glorious movie soundtrack as A/V quality and accept the directional boom that we get with the conventional effects subwoofer. We don't need to compromise any more on home theater sound quality and you won't have to adjust or turn the sub off when listening to quality acoustic recordings. Besides who has room for the big ugly thing that also compromises relationships. High-end home theater is more than just quality components assembled around an audio/video theme or it should be. In fact the myriad of sounds that we hear everyday that are included on the movie sound tracks benefit immensely from the natural qualities of TBI™ Subwoofers. You don't have to purchase two separate systems one of which will obviously sound inferior with the wrong kind of bass. With a TBI foundation your A/V system will have all of the qualities of a good high-end system and you can enjoy natural sounding stereo or multi-channel audio. Everything comes together like one wrap around event as the low frequencies follow the scenes not the sub. With the small size and shielding from the acoustics of the surroundings placement is much more versatile (high WAF). 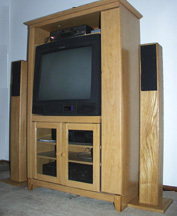 The home theater system on the right above has two vertically oriented TBI bass modules located behind the cabinet for full natural sounding effects and rhythmic music. MAGELLAN VI su bass modules are used here because they are only 5.5" deep therefore requiring minimum distance from the wall. With the close spacing of the APL towers no center channel is used so the visible speaker complement is minimal. The rear surrounds are flat fireplace mount micro-monitors. This system doubles as an audio system with no subwoofers visible at all but with full musical bass extension. The 5.5" space required behind the cabinet is typical of the space requirement for the neck of the picture tube to clear the wall. This system could be installed in an apartment or other location when no permanent flush mounted speakers can be used. The anti-resonant qualities coupled with the enhanced lower volume listening minimize through the wall noise transmission. The flexibility of placement of the TBI™ Bass Extension Modules eliminates the need for in wall subwoofers that don't really provide the natural bass that we are trying to achieve. The use of multiple modules distributed in key locations can provide an exceptional surround experience and with TBI™ Subwoofers you don't have to blast the sound for enjoyment.